Happy Montebello clients trust dermatologist’s experience with Botox. Botox Cosmetic was approved by the FDA in 2002, and it has since grown to reign as the most popular nonsurgical cosmetic procedure among both women and men. We’ve dispelled some common myths about Botox below. 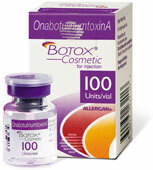 Wait, wait … Botox is made from the same bacteria that cause botulism. How can that be? It seems unlikely the toxin injected to smooth eyebrow furrows and crow’s feet is also one of the world’s deadliest substances. It’s responsible for botulism, a type of food poisoning that kills by paralyzing the muscles needed to breathe. The distinguishing factor is dosage. The botulinum toxin that relaxes wrinkle-causing face muscles is highly diluted. Unlike the food-borne poison, Botox injections are limited to targeted areas of the face – not administered in a way where the heart and lungs would be affected. The toxin’s benefits don’t stop here; before the green light was given for cosmetic use, it was used to treat conditions including crossed eyes, uncontrolled blinking, and excessive sweating. Botox will make my eyes droop. Droopy eyelids, crooked smiles and dry eyes are very rare, with an incident rate hovering in the 2 to 3 percent-range. These side effects occur when improperly placed injections migrate to neighboring tissues. These conditions usually resolve in a few weeks. Typical side effects are short-lived and minor, including swelling, bruising, and headache. Small doses introduced to specific muscles preserve the expressions that make us human. This approach results in softer lines without inhibiting the action of the muscles, so the appearance looks natural. “Frozen face” happens when too much Botox is injected. Do you notice a theme? Proper administration in a safe, medical setting is key to successful, worry-free procedures. Trust Dr. Blose's 10-plus years of professional training and experience with Botox. Call (562) 457-6770 to schedule an appointment.